In mid-October this year, Huawei launched in London its Mate 20 smartphone series comprising four models, with prices ranging from 799 euros ($906) to 2,095 euros ($2,377). 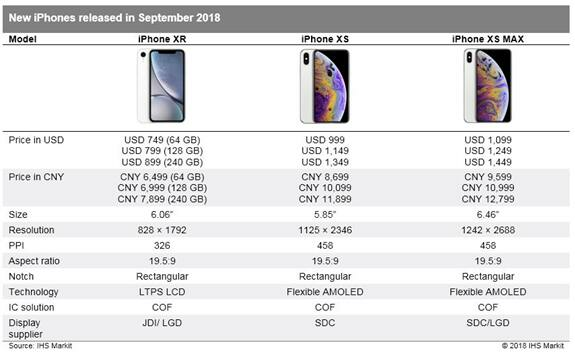 This compares to the iPhone's price range of $749 to $1,449, making the iPhone and the Mate 20 close rivals in the European market. 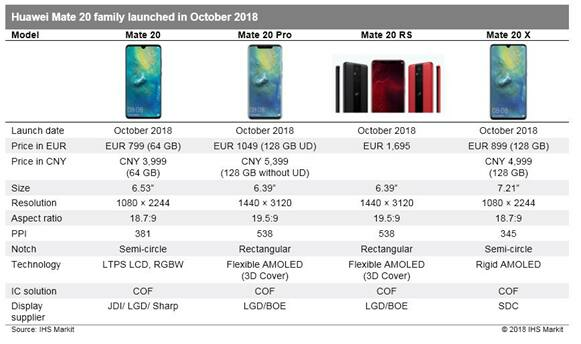 However, the price of the Mate 20 series in China is much lower than in Europe. The Mate 20 uses an LTPS LCD display, which is supplied by Japan Display, LG Display, and Sharp; Sharp was also the supplier of displays for last year's Mate 10, according to the IHS Markit Smartphone Display Intelligence Service. Although the size of the Mate 20 is up from 5.88 inches to 6.53 inches, resolution is down from wide quad VGA to FHD grade at 418 ppi, with an 18.7: 9 aspect ratio and a semicircle notch design. Both the Mate 20 Pro and Mate 20 RS use flexible AMOLED with a notch, as well as a 3D cover glass, 1440 × 3120 resolution, and 19.5:9 aspect ratio; the displays are supplied by LG Display and BOE. So far, this is the most difficult process yet for a display that is being mass-produced, because it has both a notch design and 3D cover glass. For display makers, Huawei is developing a reputation as a tough customer given the Chinese maker's extremely high standards on specification and performance, making mass production difficult. LGD and BOE have a big challenge on their hands to ship the 5 million displays that Huawei has requested, but the shipments will help Huawei reach its business goals. Overall, flexible OLED displays are recognized as a business and technology breakthrough—for BOE in China, as well as for LG Display in South Korea. These developments are encouraging, especially because Samsung Display has long dominated the field. Compared to last year's Mate 10 Pro, the Mate 20 Pro has been updated to use flexible AMOLED, pushing up the price in Europe by 250 euros ($284). However, the price in China remains the same despite the display upgrade. In Europe, the Mate 20 Pro has a starting cost of 1,049 euros ($1,190); the same model will cost buyers in China 5,399 yuan ($774), making the Huawei phone competitive with the iPhone XS, which is priced at 8,699 yuan ($1,247). However, in Europe, pricing for the Mate 20 Pro is almost the same as that of the $1,099 iPhone XS. The Mate 20 RS uses the same display as the Mate 20 Pro, and will go on sale a month later than other Mate models. However, it will stay at the same price as the previous Mate RS. Huawei has also brought out a new model, the Mate 20 X with a 7.21-inch rigid AMOLED supplied by Samsung Display. The phone has a semicircle notch screen with an 18.7:9 aspect ratio, but its resolution of 345 ppi is the lowest out of the three displays. The Mate 20 X has no comparable competition for now.